Sam was involved with the farm since its beginnings in 2010. From 2012-2015, he was the General Manager and helped the farm to transition into a community-owned enterprise. Sam lives in Sutton and is a passionate VegBox customer. Before the farm, he worked as a Sustainability Consultant for local charity, BioRegional, delivering various projects in the community (2008-2012). Following this, he went to Kenya to help establish a successful renewable energy company. 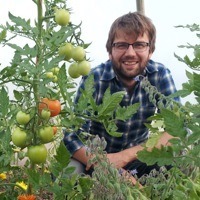 Sam currently works as a sustainability advisor, specialising in food and the circular economy.